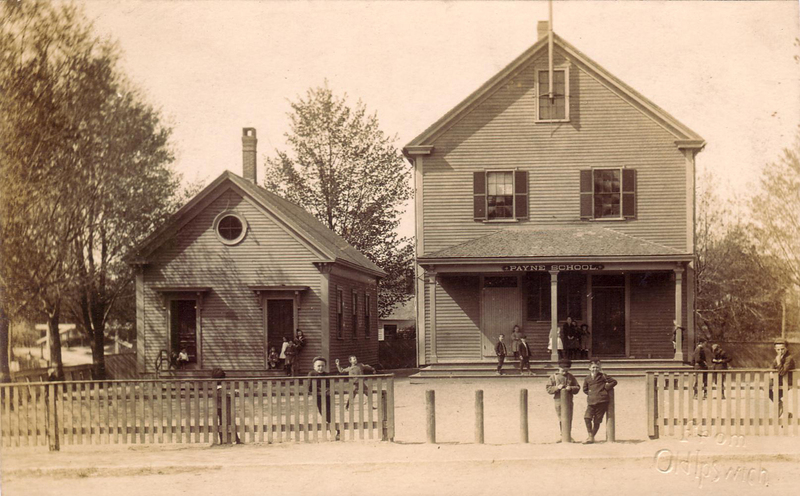 Featured image: Manning School, and the first Winthrop School on the left. 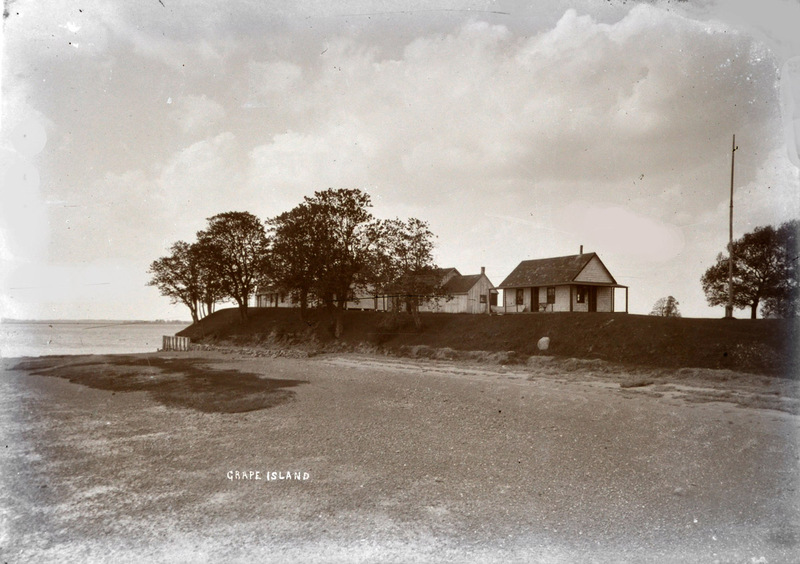 Photo by George Dexter, circa 1900. 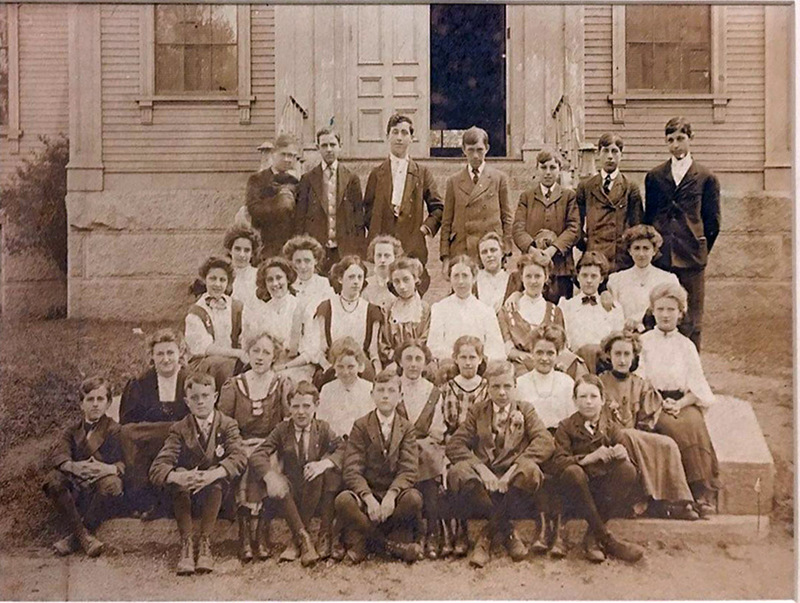 Excerpts from The History of the Ipswich Public Schools, an excellent article written in 2008 by William E. Waitt, Jr, who served as teacher and principal in the Ipswich Public Schools for 36 years; and A History of the Ipswich Free Schools by Thomas Franklin Waters Photos were added by town historian Gordon Harris. 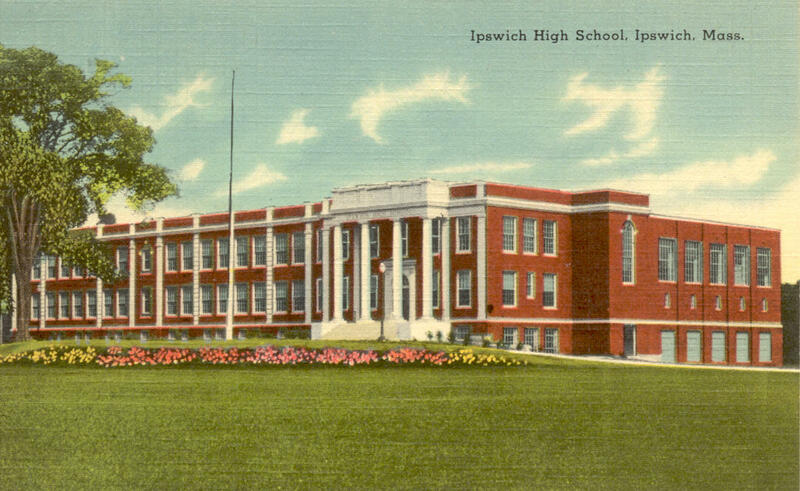 Download The History of the Ipswich Public Schools as PDF. Ipswich in the Massachusetts Bay Colony by Thomas Franklin Waters, 1910. 1633: Agawam (Ipswich) is settled by John Winthrop, Jr. The “Dame School” is established in the colonies and the towns’ foremost citizens who did not attend grammar schools are in attendance. 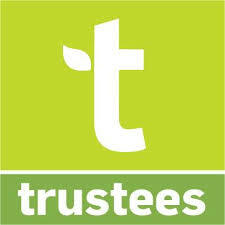 Goodwife Collins dedicates more than 30 years to teaching in this first important step towards education. 1651: A grammar school is established and endowed, which was known as The Feoffees of the Grammar School. Mr. Robert Paine, according to another source, built the schoolhouse, completed in 1653, near the corner of County Road and Linden Street, facing the green, and it continued in use for a half century. In 1742 Linebrook School was established in the outer Linebrook area (known at the time as the first parish). Photo 19th Century, photographer unknown. 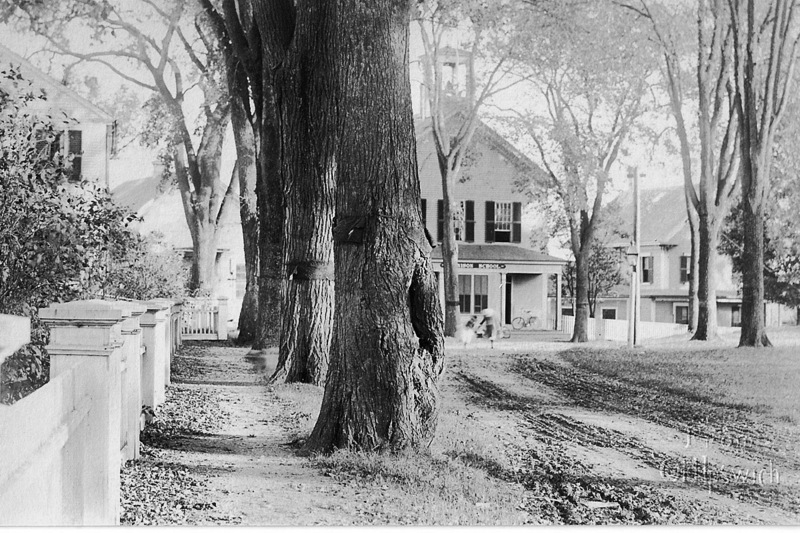 1794: A schoolhouse was built in the “school orchard” at the corner of Argilla Road and Linden Street,near the site of the original Payne School, across from the South Green, originally known as School House Green. 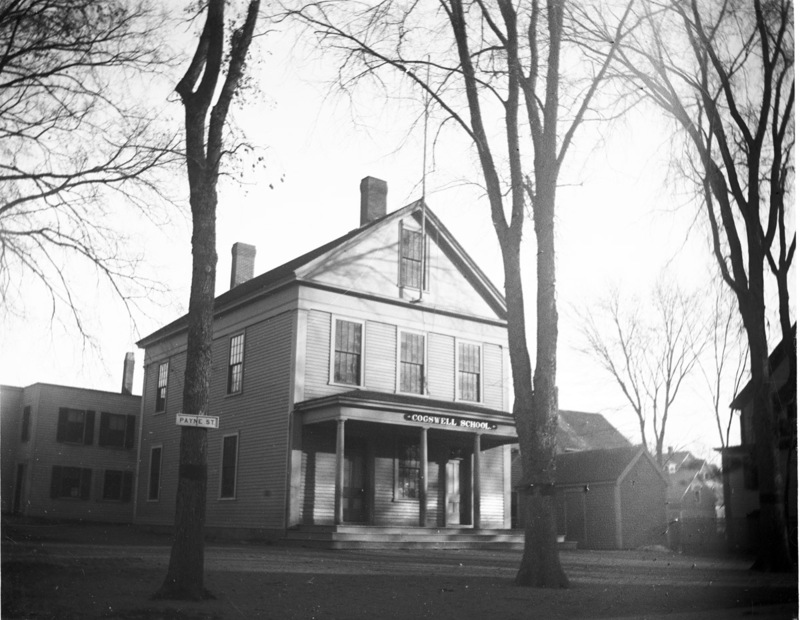 In 1808 the town’s first High School opened at this location, and in 1828, the Town voted to build a second floor to the schoolhouse. 1828: The Ipswich Female Seminary, a private women’s school was incorporated, and Miss Zilpah Polly Grant and Miss Mary Lyon (hired a year later) were hired. (In later years Miss Lyons founded Mt. Holyoke College.) In 1843 The Rev. and Mrs. John Cowles took over the Ipswich Female Seminary and it became famous as a popular school. 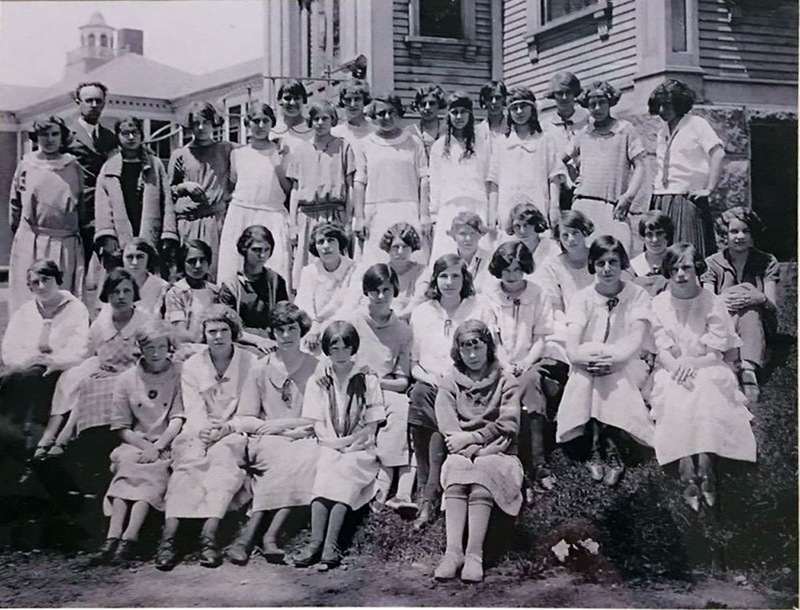 The Ipswich Female Academy closed in 1876 as public schools became open to all students. 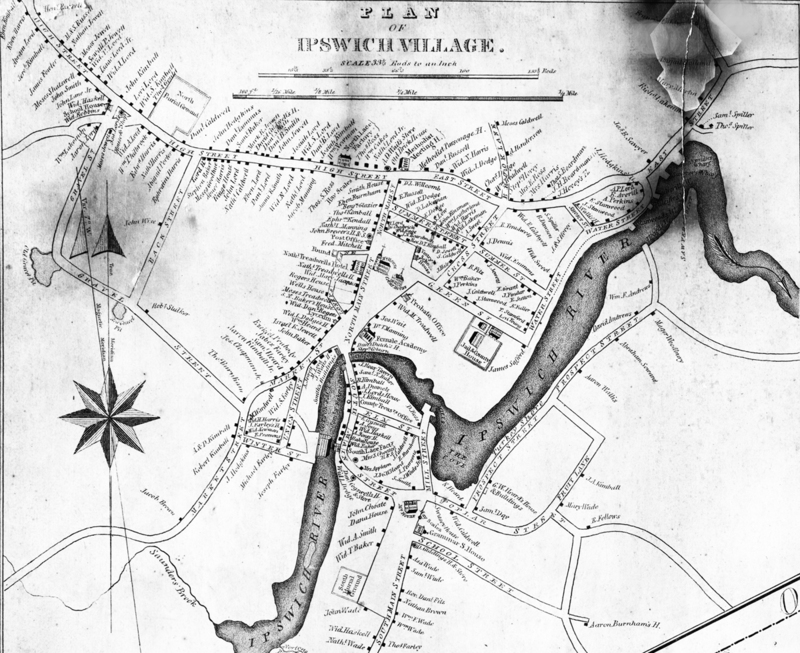 The 1832 Ipswich Village map, showing distribution of schools in the village. 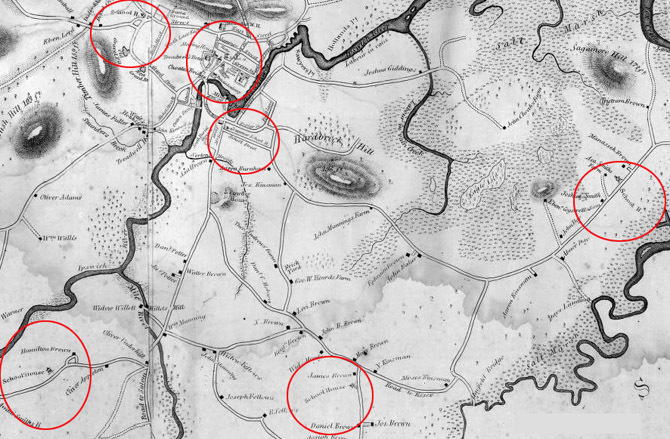 The 1832 Ipswich map shows rural schools at Argilla, Candlewood, and Waldingfield Roads. Candlewood School near today’s Candlewood golf course, and the Argillla School, which was constructed in 1808. 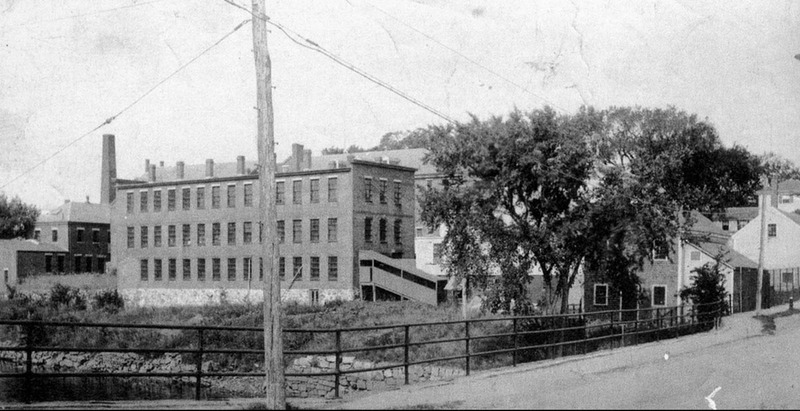 The Argilla building was near 188 Argilla Rd. 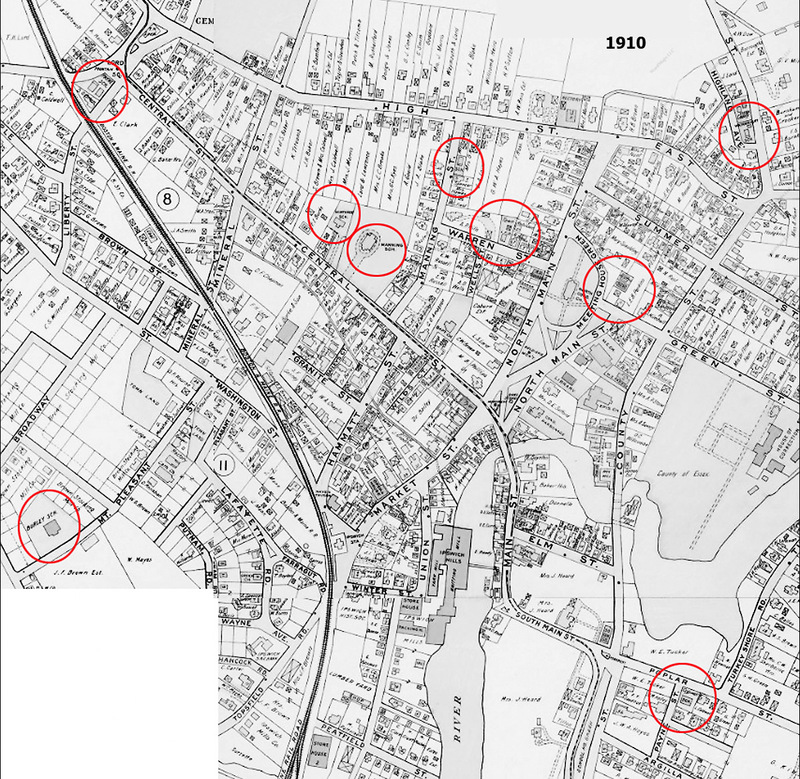 was still shown as an active school in the 1910 Ipswich map. (I wonder if that building may still be standing nearby). 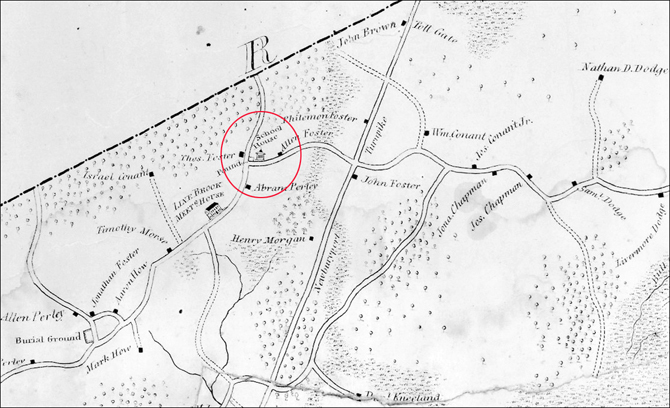 The Linebrook School is shown at the intersection of Linebrook and Leslie Roads in the 1832 Ipswich map. 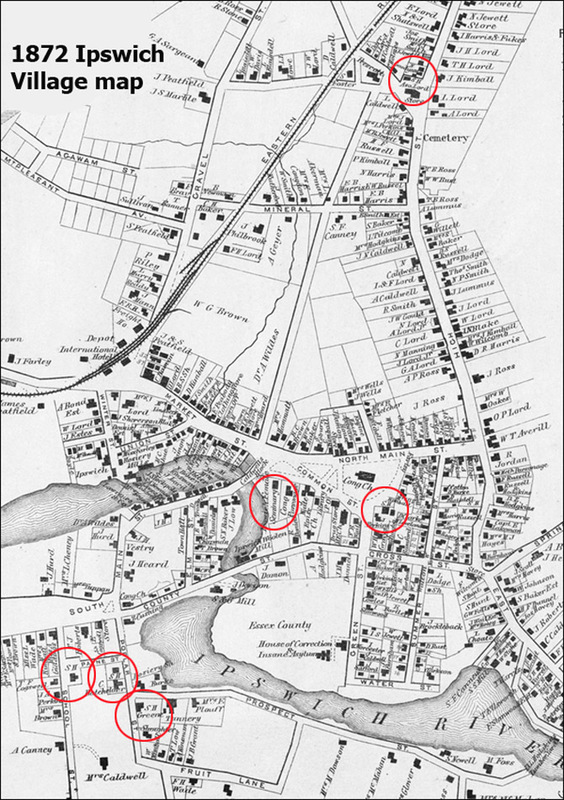 The 1872 Village map has the public schools marked simply SH (circled in red). The Town House has been moved to Depot Square by Mr. Damo. The Dennison School is still at Meeting House Green, and there are now three separate school houses near the South Green (School House Green). The Payne School at Lords Square has not yet been moved to its current location. The Ipswich Female Academy is still operating. 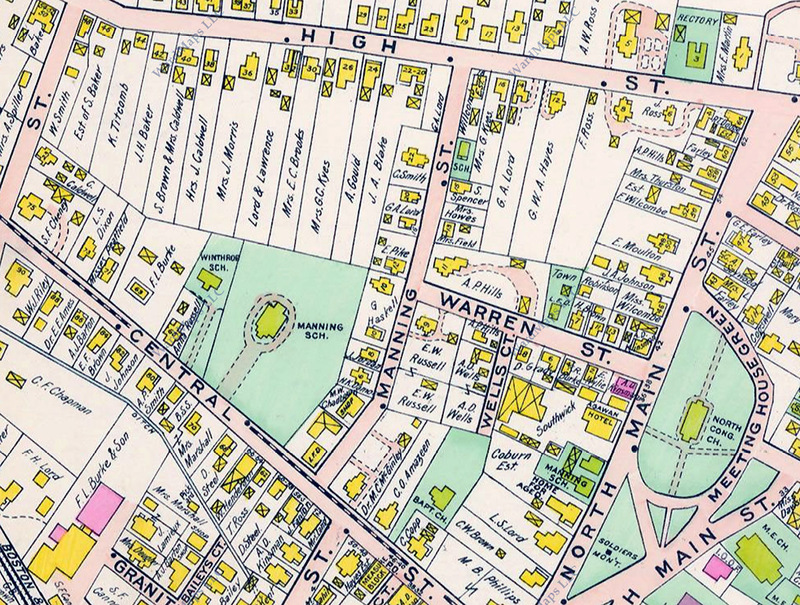 Central Street has been created but the Manning and Winthrop Schools do not yet exist. Girls at Manning School. The Winthrop School is in the background. Photo courtesy of Laura Smith. 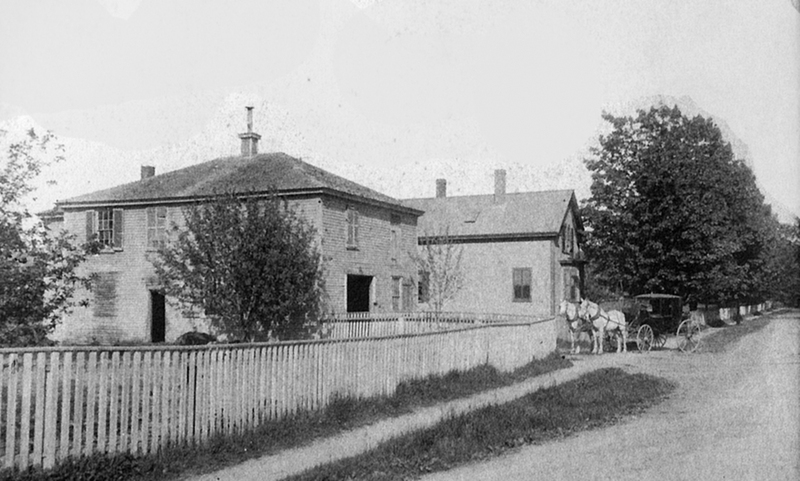 1890: The Wainwright School was constructed at a cost of $7,700. Edie Cook informs us that the school-house was originally beside the Payne school and was moved to its present location at the corner of Spring and Highland Streets. 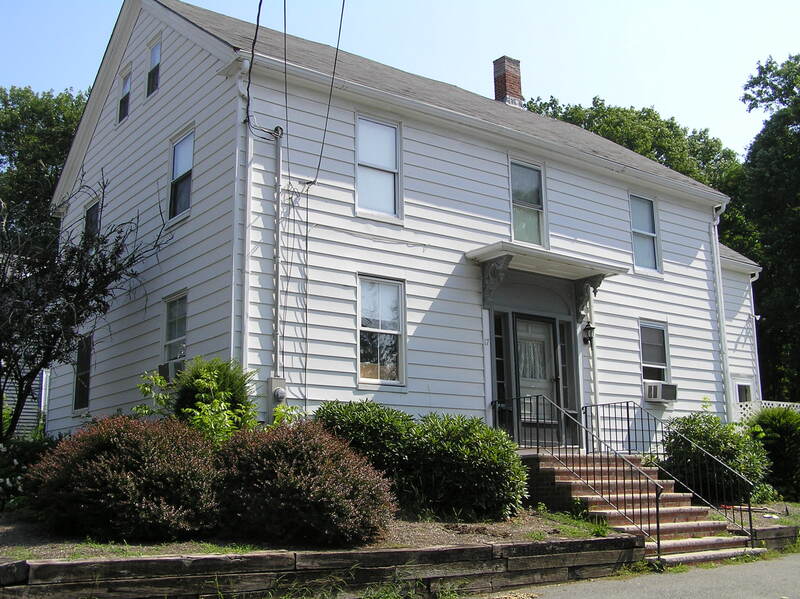 Photo from Ipswich Patriot Properties site. 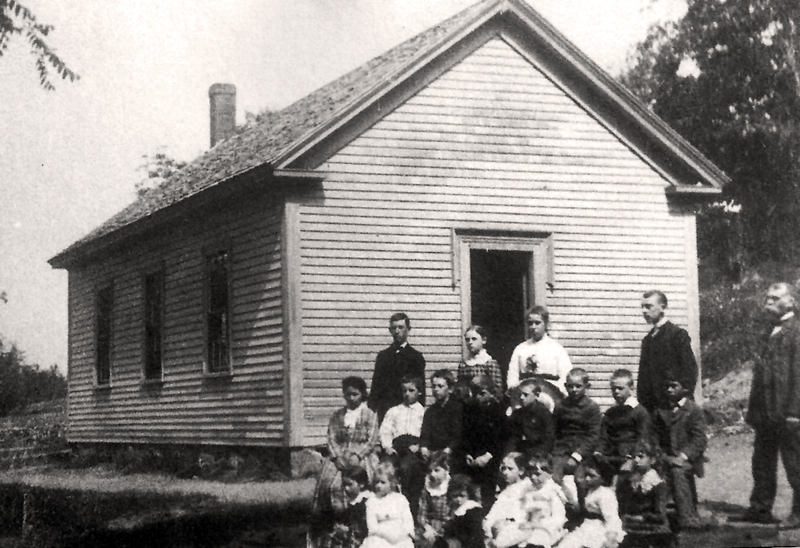 1802 The North District decides to construct a schoolhouse with public subscription. Dr. Manning gave half the funds for its construction. The building was one story. This was the beginning of the Payne School in Lord Square. It was originally across the square next to the present Dunkin Donuts. 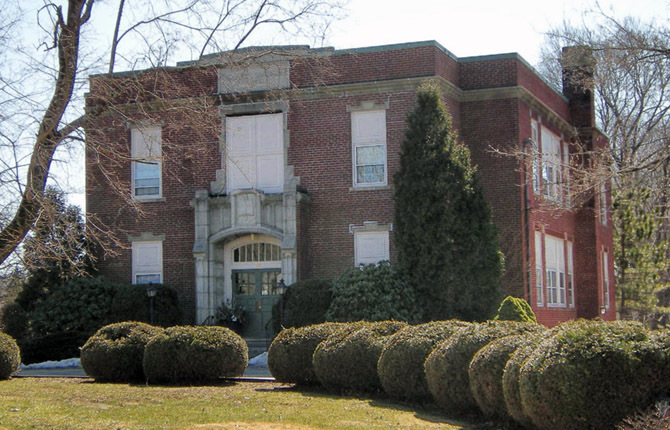 The smaller building was moved to Highland Ave and is known as the Wainwright School. 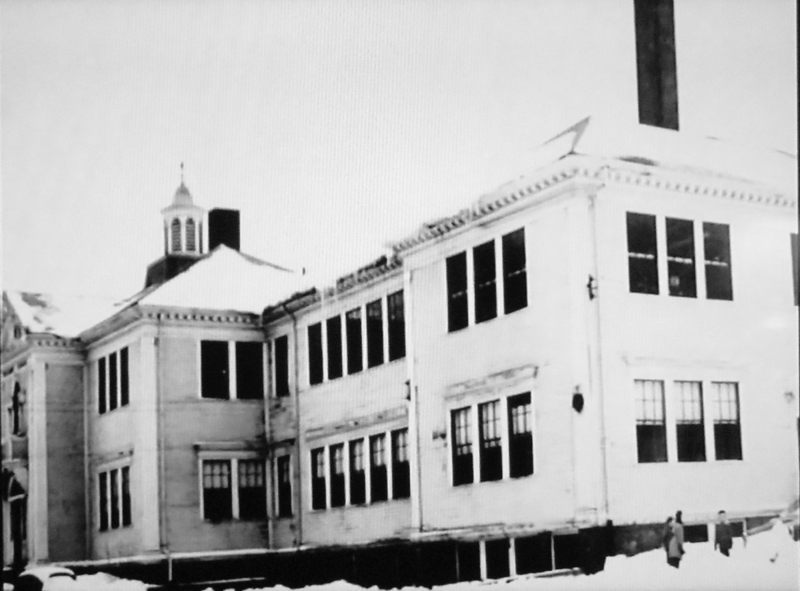 In 1926 the Shatswell School was constructed on Green Street, consolidating several small schools, including the Dennison School on Meeting House Green, the Cogswell School on Payne St., and the Wainwright School. 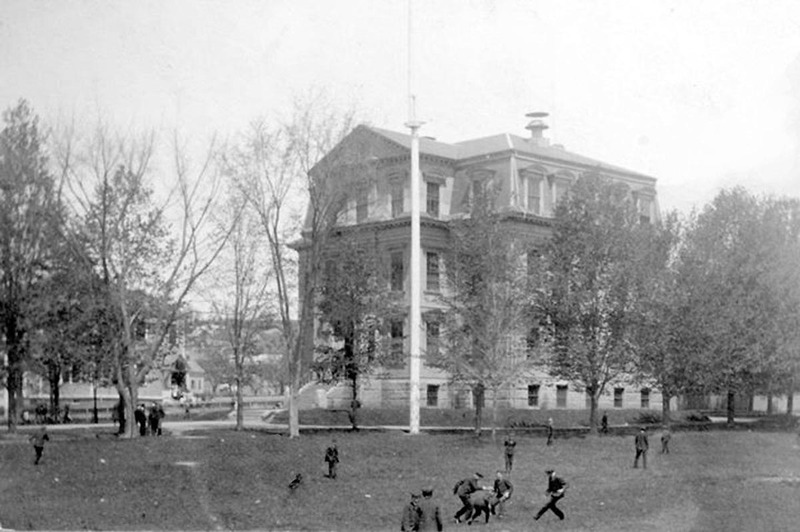 In 1891, the Payne School got extensive repairs and was moved across the square to its present location. According to the Chronicle, the second floor was added at this time. 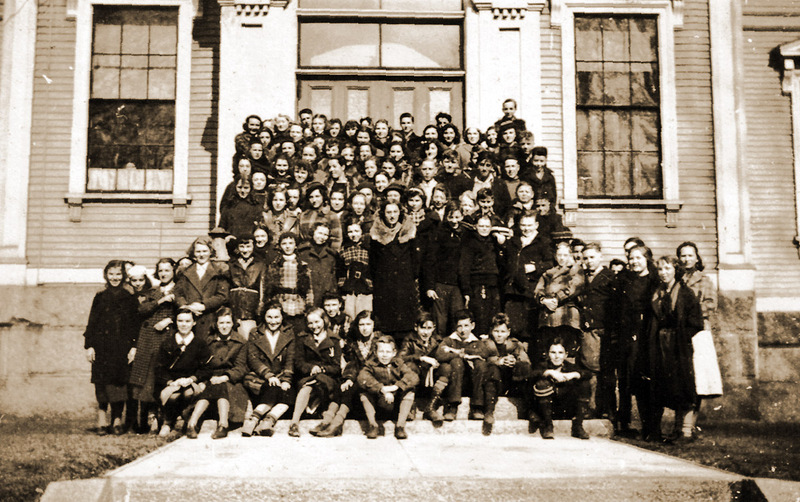 In 1943 classes were suspended at the Payne School and teachers and students were transferred to other schools. The building now serves as the school superintendent’s office. 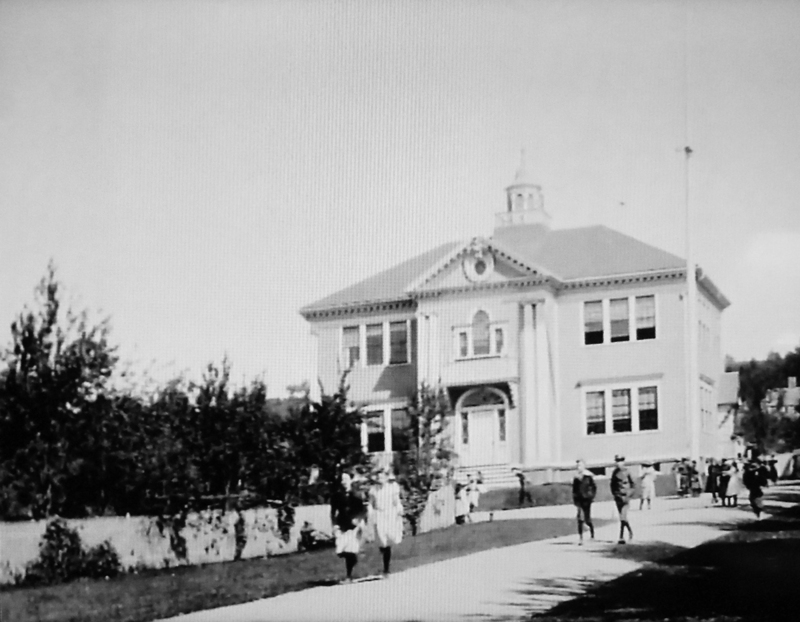 1908: The Burley School (4 rooms) is added to the school system. Burley replaced the classrooms housed at the Colonial Building. The new school housed two grades in each room grades 1-8. One of the features was the second floor was equipped with electric outlets so that slides could be shown to supplement instruction. 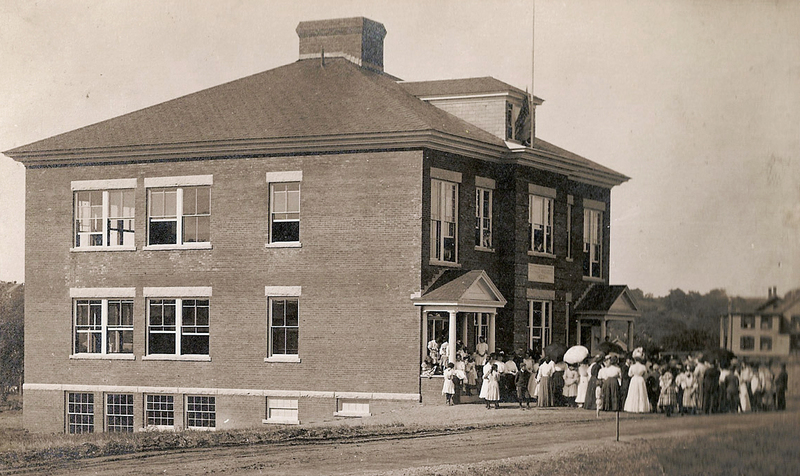 In 1921, a six-room addition was added to the Burley School. The building is now residential. Photo by Edward Darling. In 1910, the Warren Street firehouse was converted to a school to house two 7th grade classrooms. The building was sold in 1926, and has since that time been a residence. Photo by Ipswich Patriot Properties. 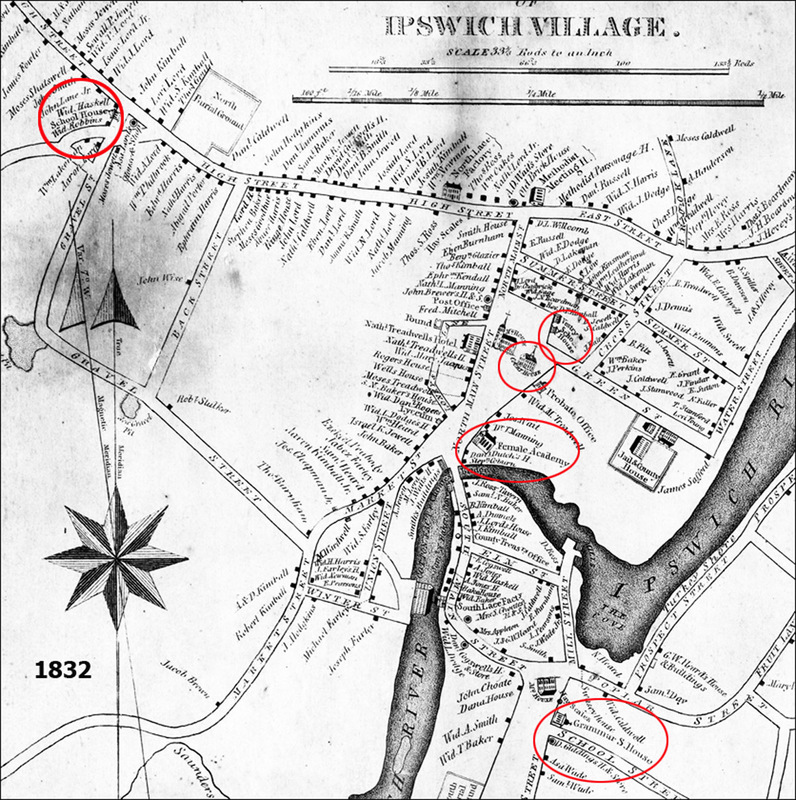 In the 1910 Ipswich village map, the town is dotted with schools. Manning and Wintrhop on Central St., and the Burley School are the large facilities. Children are attending classes at the Cogswell School on Payne St., Payne School at Lords Square, the Candlewood School which has been moved to Manning St., the Warren firehouse has been converted to classrooms, the Wainwright School has moved to Spring St., and the Dennison School is still operating at the North Green. 1920’s and early 30’s: The second story of the Old Town Hall (on South Main Street) was used by the High School as an assembly room and a performance center during the late 1920s and early 1930s because the third floor of the Manning High School was not usable. In 1936 The new High School on Green Street was occupied and classes started. After a very long time and after much debate by several committees a new high school was voted on, with federal funds (the Town voted $120,000 to be added to a federal government grant of $111,725.00) and construction began in November 1935 with final completion on February 6, 1937 with a final cost of $229,000.00. At the time it was considered “a superior building” and the “pride of The Town.” Although bronze plaques were erected just inside the vestibule, few citizens know that this building was erected in memory of the veterans of World War I. The old jail workshop from the Green Street Jail was used for a woodworking shop, a print shop, cooking, sewing, home economics and a heating plant. 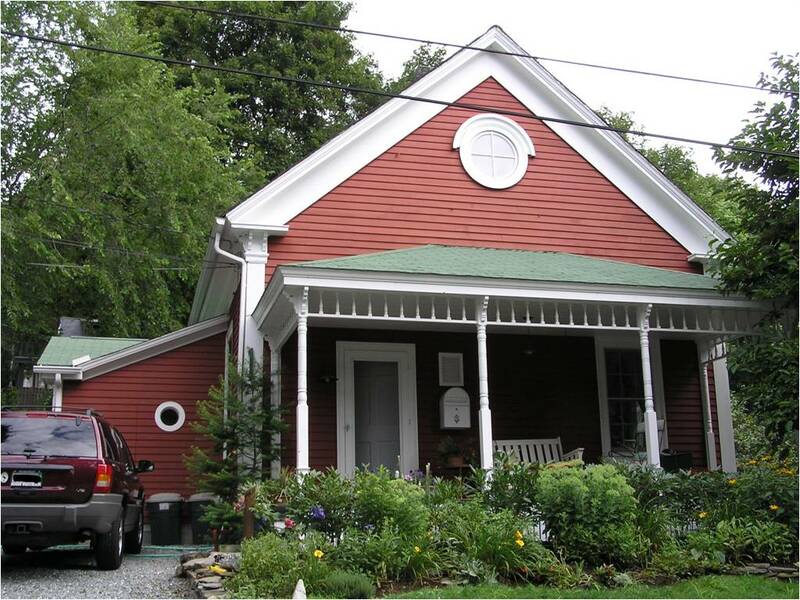 (It now serves as a residential facility). 1963 was an exciting year because in this year double sessions ended and all high school activities were transferred to a new building on High Street while Grades 6, 7 and 8 continued to use the old high school building which becomes a Junior High. 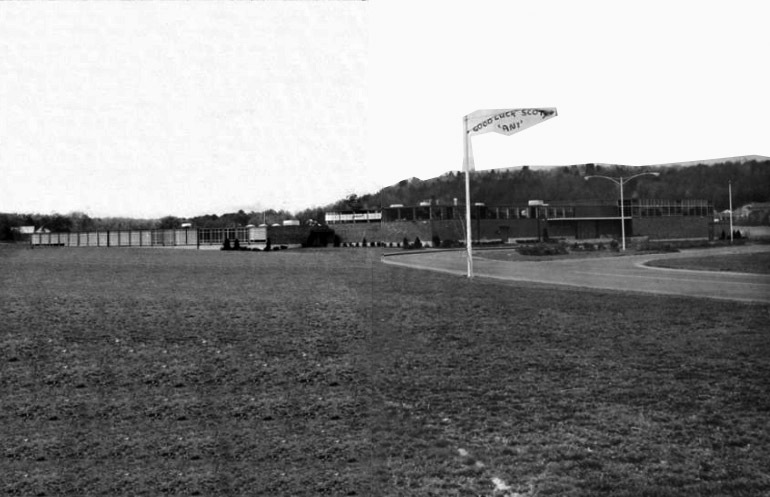 In 1956 the new Winthrop School opened with an enrollment of 425, and had 16 classrooms plus support rooms. In 1984 a portable classroom was added to the Winthrop School for the G.A.T.E. program. 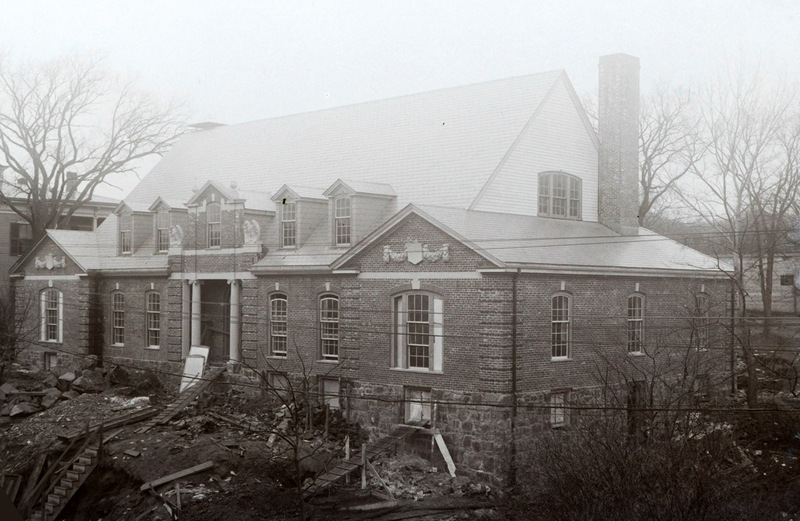 In 1986, a 10-room addition and extensive renovations were started at the Winthrop School. 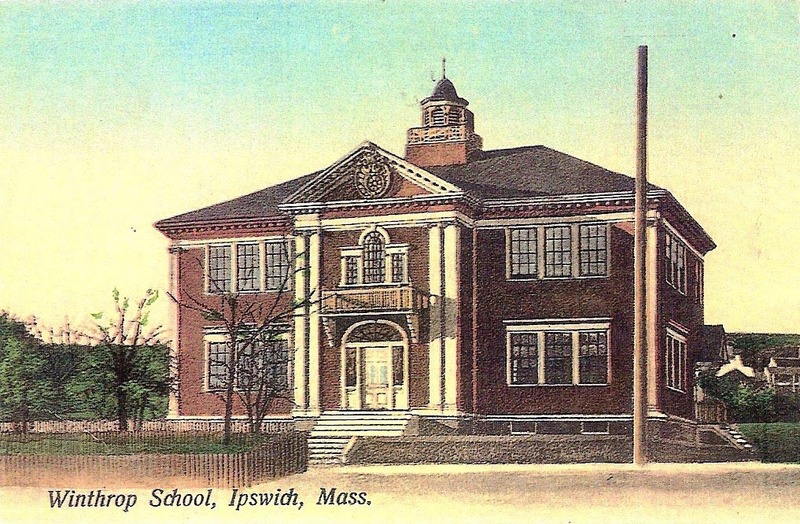 With the construction of this building Ipswich reached a landmark in that this was the first elementary school built with automatic oil heat, unit ventilators, sinks and bubblers in classrooms, an auditorium/cafeteria, a playroom, movable furniture and an internal sound system. The total cost of construction was $635,000.00, less State aid. 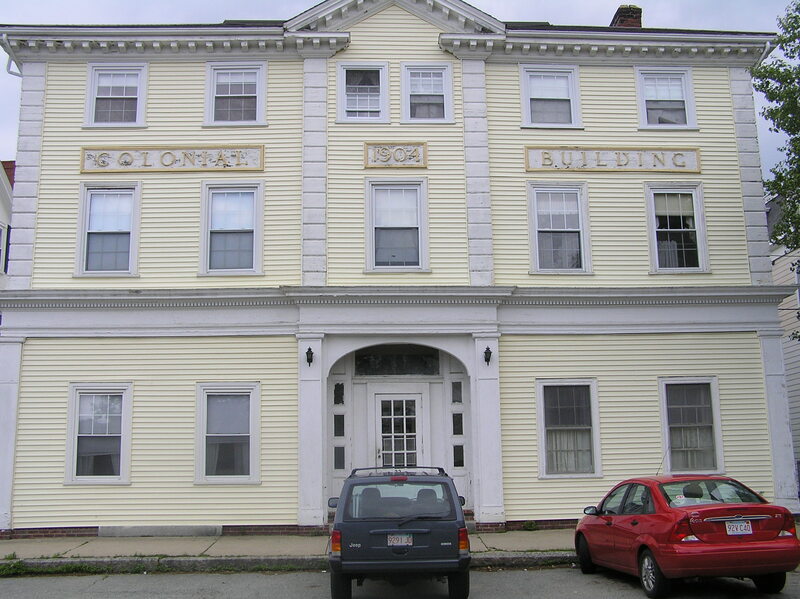 The school replaced the old 10 room wooden Winthrop School (that was located in the front of the school to the right of the middle door) and had served the town for 70 years. In 1961 Boone Hall (parish house) at Ascension Memorial Church had its first use as an extension of the public school. 1963: A new High School was opened on High Street and double sessions ceased after nearly 10 years in June. The old high school on Green St. became the junior high school. After much discussion, planning, failed voter ballots, overrides and plans, the Town Meeting decided to build a new middle school on the property in stages of less than $500,000 in order prevent defeat at the ballot. The 1963 building served the needs of the Town but was of the cheapest construction and was not suitable for an expanded high school curriculum so it was decided to build a new facility. 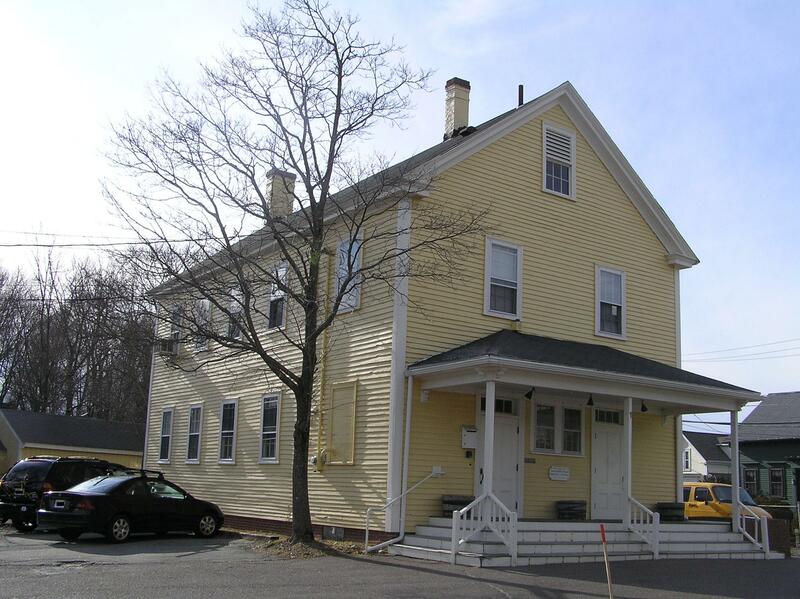 A committee, beginning in 1992, was appointed to study the situation and they decide the site was excellent but the building should be torn down after a new one (the current Ipswich Middle/High School)was built in front of existing building. Photo cover of 1965 Ipswich Annual Report. 1965: The Linebrook School opens as a 10-room school. 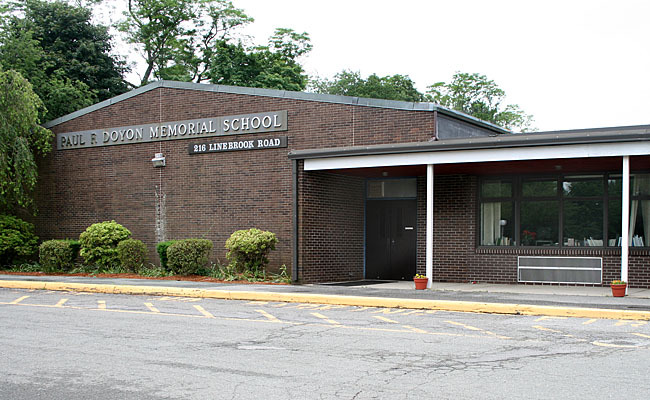 In 1967, a twelve-room addition is added to the Linebrook School and the name changed to The Paul F. Doyon Memorial School in honor of our first Viet-Nam War casualty, and kindergarden was started at Doyon School. 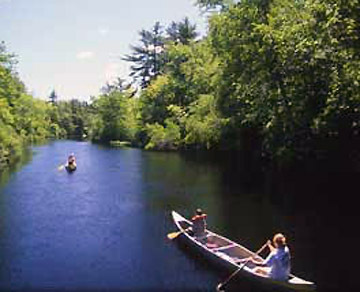 1994 After a failure at the polls, the addition to the Doyon is started as well as a new septic system for $538,000.00. 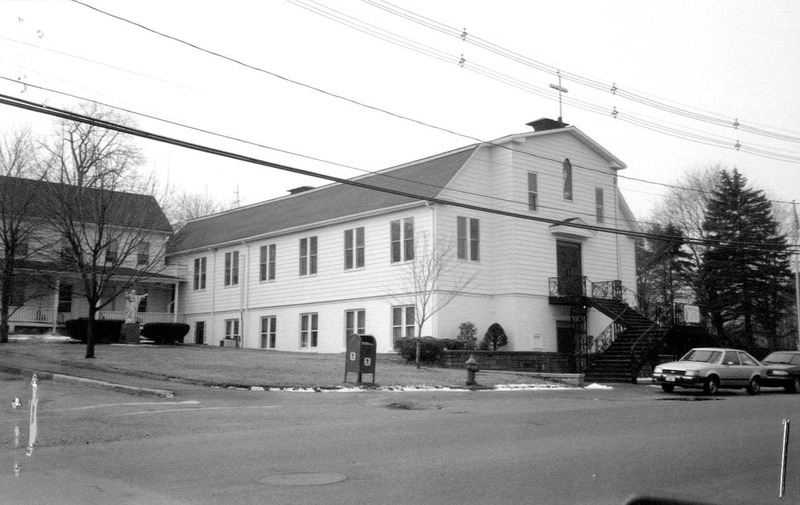 1969: The Memorial Building facilities were used for school, housing two grade 6 classes.The building was constructed in 1924 as a gift to the town by Richard Teller Crane, Jr who builds Crane Castle. Photo by George Dexter, early 20th Century. The old shop building of the old County Jail was used as a manual training center, a print shop, home economics center, a wood work shop and many other uses as well as a boiler room for its next door neighbor throughout the years. In 1944, the manual training program was moved from the basement of the Winthrop School to the shop building. In 1997, two modular classrooms were added to the Whipple School. 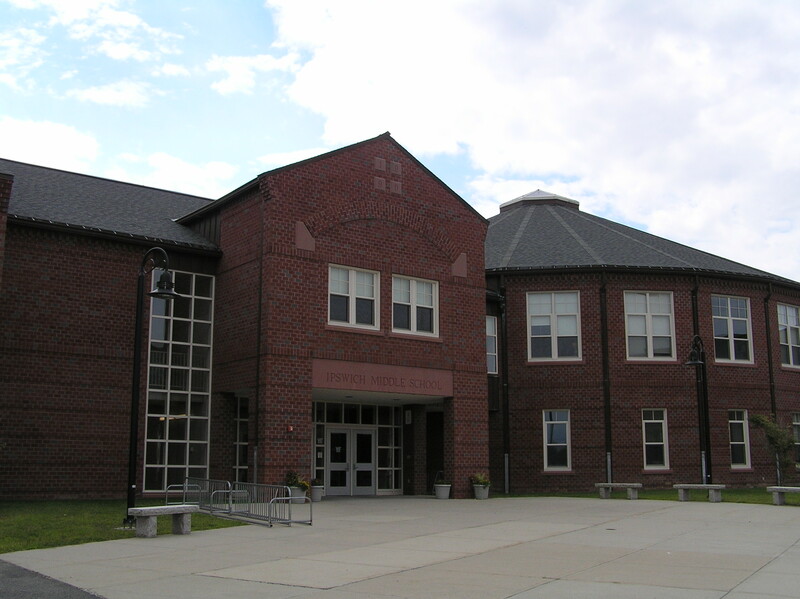 This building was moved to the end of the Winthrop School (in 2000) when the new Middle/High School was opened. It still is in use today. Photo from Whipple Terrace site. In 1996, voters approved a new middle/high school for High Street at a cost of $31.9 million. After construction delays, the new facility opened in September, 2000 with 512 students in the High School and 502 in the Middle School. A Performing Arts Center was an exciting part of the new facility. 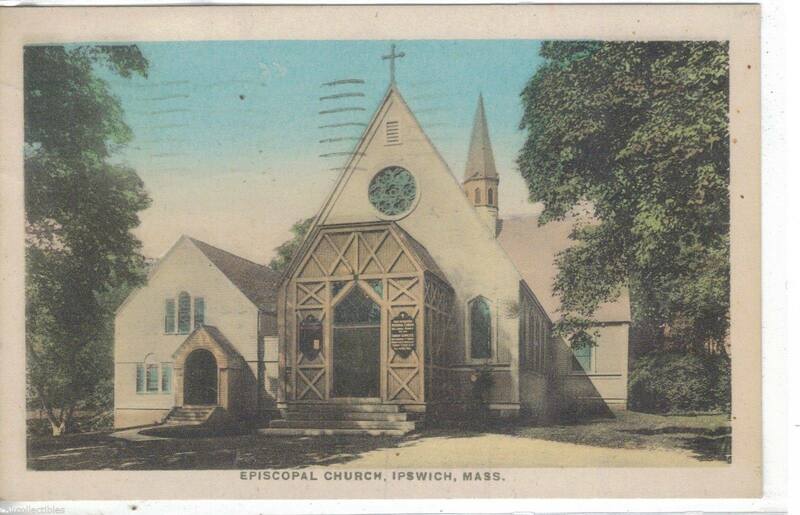 From the two-volume set Ipswich in the Massachusetts Bay Colony by Thomas Franklin Waters, 1910. 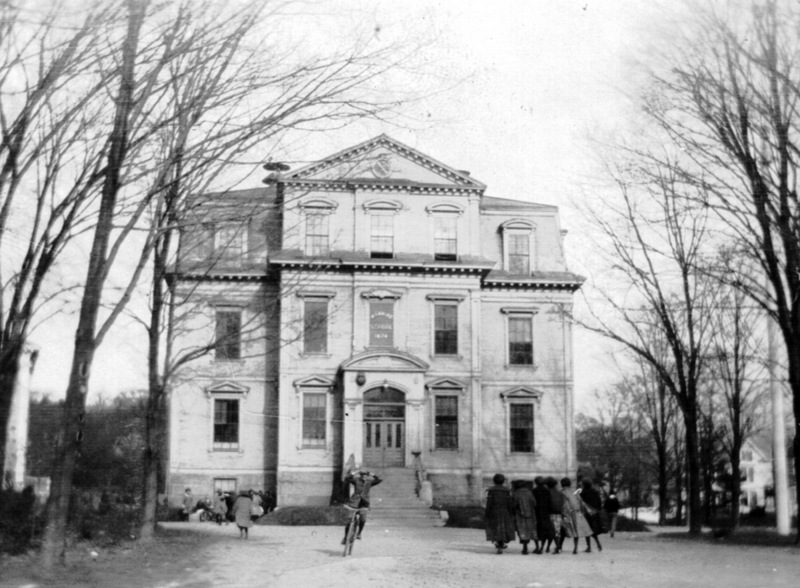 “A Committee to provide a building for the town school was appointed in January, 1651-2, and studious effort to secure the best educational advantages is manifest in the annual provision for the public school and frequent contributions to Harvard College. 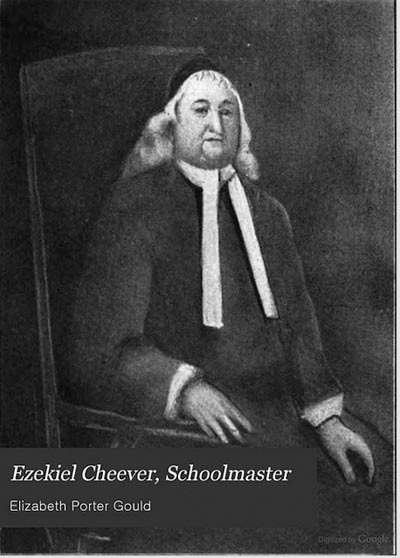 Ezekiel Cheever, the famous teacher of the Ipswich Grammar School. 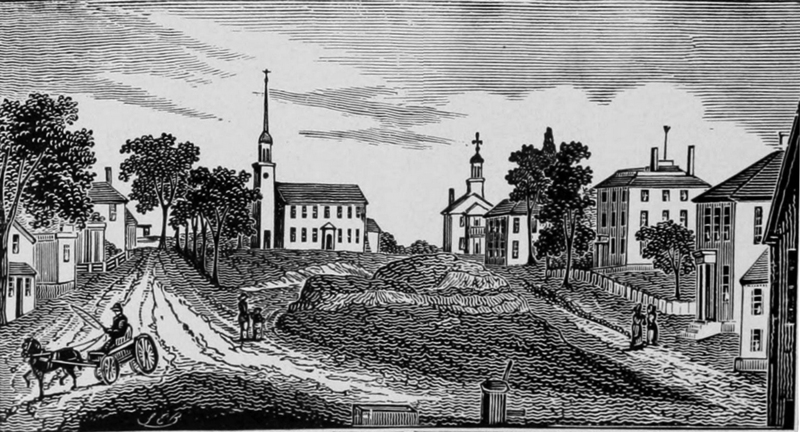 A Committee to provide a building for the town school was appointed in January, 1651-2, and studious effort to secure the best educational advantages is manifest in the annual provision for the public school and frequent contributions to Harvard College. Mr. Robert Payne “at his own proper cost & charge” built an edifice for a grammar school, which was erected in the corner lot, bounded by County Road and Poplar St. Mr. Paine held title to this estate until 1683, when he conveyed it to the Feoffees. There Mr. Cheever made his home. When Scholars had so far profited at the Grammar Schools, that they could “read any classical author into English, and readily make and speak true Latin, and write it in verse as well as prose; and perfectly decline the paradigms of nouns and verbs in the Greek tongue, they were judged capable of Admission in Harvard College. This was the substance, then, of the course of study in the Ipswich Grammar School, though room was made probably for the elementary studies in reading, writing and arithmetic. The School became famous, and many boys came for their preparation for College. So many Ipswich boys graduated from Harvard in those years, that we are sure of the names of some who were trained by Mr. Cheever. Little children, and girls of any age, were not eligible for the Grammar School and there were “dame schools,” taught in private houses in the various neighborhoods. 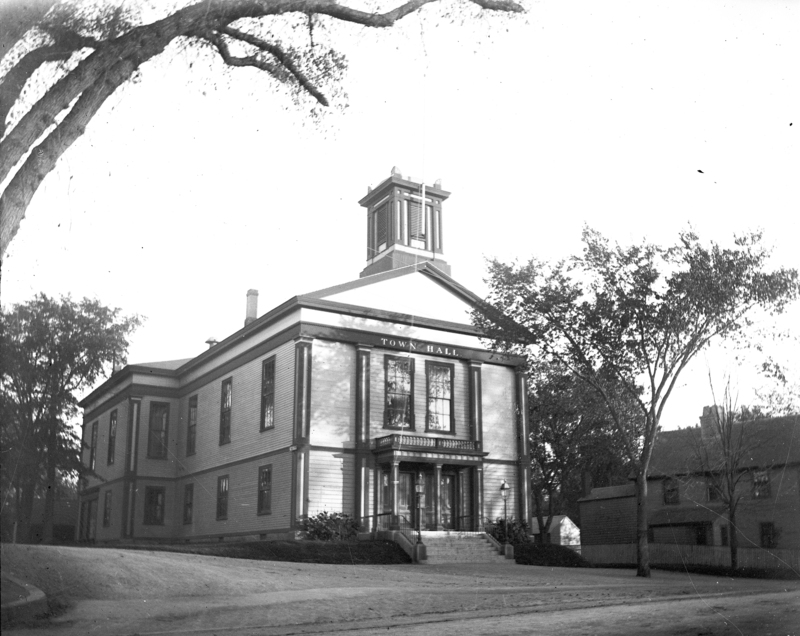 One of the finest and strictest was run by Madame Rogers at the spot where the old South Congregational Church stood. When the church was built, the Rogers house was moved down County Rd., and still stands today. Daniel Rogers became the Teacher of his old school, and remained in it until 1716, fitting fifteen young men in that time for the College. In after years, he became Justice of the Quarter Sessions Court and Register of Probate, and lost his life in tragic fashion on the Salisbury marshes in 1722. Returning from Salisbury where he had been holding Court, he lost his way in a blinding snowstorm, Dec. 1, 1723, and strayed out on the marshes, where he perished. His gravestone in the Old Burying Ground on High St. The school-house built by Mr. Robert Paine in 1653 for the use of the Grammar School, facing the School-House Green, as it was then called, continued in use for half a century. The watch-house near the meeting-house and was no longer needed for that purpose, the peril of Indian attack no longer remained, and it served the community as a crude school room, with “such woman, as will teach children to read and as in y’ prudence” to be appointed by the selectmen. In 1704, the Town built a Town House “with a school-house under it,” near the great ledge on Meeting House Hill with the help of the County. Town meeting voted on a resolution that specified a building about 32 feet long, 28 feet wide and 18 or 19 feet tall “with a flat roof raised about 5 foot” It was located on the grass plot in front of the Methodist church, close to a huge ledge that reached nearly to its eaves, which was blasted away many years ago. A school room was provided in the lower story and the Court room occupied the upper floor. The school continued in this location until 1794. As the population grew, the old Town often resorted to many makeshifts in regard to a proper school building. As early as 1714 it was voted that “the watch-house should be improved during the summer by some person who will undertake the teaching of young children to read.” In 1731, the town resorted to using the almshouse for classes. At the same time, contentions arose between the town and the Feoffees regarding the Little Neck trust, regarding receiving and applying the rents, or of ordaining and directing the affairs of the school. The Town thus assumed complete control of the Grammar School, but tensions would continue for almost 300 years until the trust was abolished by Town Meeting in 2009. In 1798, Dr. Samuel Dana was the schoolmaster. His letter to the selectmen reveals the decadent condition of the ancient school. The Town’s people were dissatisfied with it and bright boys like Daniel Treadwell, the future Harvard Professor, were sent to school in other towns. The teachers were capable and often brilliant, but their tenure was brief and continuity of work was impossible. Owing to the failure to provide adequate salary to teachers, the Grammar school was not kept in use after 1818, and the town hoped for some way for it to be kept open constantly, and thereby add to the number of our publicly educated men. 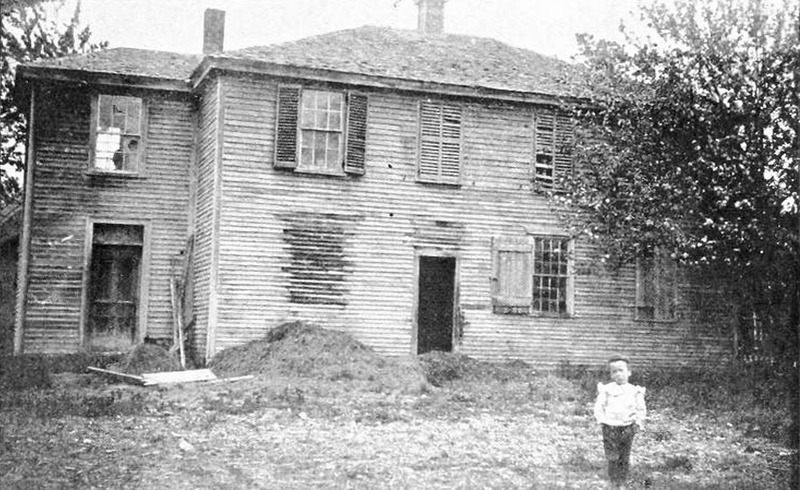 Though a reading and writing school on the South side of the river for those that lived within a mile and a half of the body of the Town was provided for in June, 1802, there was no school-house. It may have been kept in a room in Doctor Dana’s parsonage. It was proposed that the unfinished portion of the Grammar School building be fitted for school purposes, and a subscription paper was circulated in February, 1828, “to defray the expense of finishing the Grammar School house for a male academy.” The Ipswich Academy had been established in 1825 as a school for both sexes, but proved a failure. The Feoffees were keenly aware of the decline of the school, and in the year 1835, an earnest effort was made to adjust it to the changed conditions of the time. They had built a new school building about 1794, but because of their lack of funds, only the upper room was finished, and the lower room remained unfinished until the South district secured it for their use. The establishment of an English High School was now a theme of popular interest. 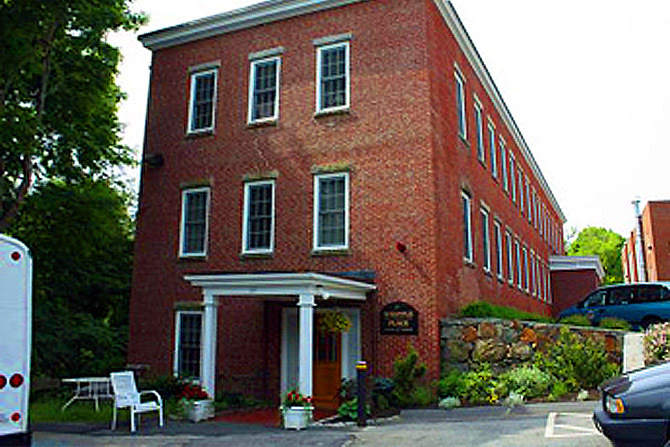 The Feoffes built a new school at the site of the original Ipswich School near the South Green, and offered the use of their school-house and $300 annually from their funds on the conditions that the School shall combine the advantages both of a high English School & of a Latin Grammar School, that the Master of the School shall be selected by a Committee of the Town and approved by the Feoffees, and that all the youths belonging to Town who shall be pursuing a course of study preparatory to College may enjoy the advantages of the school. A file of School Reports, beginning with the year 1846 affords us a suggestive picture of the Schools in the first half of the 19th Century. 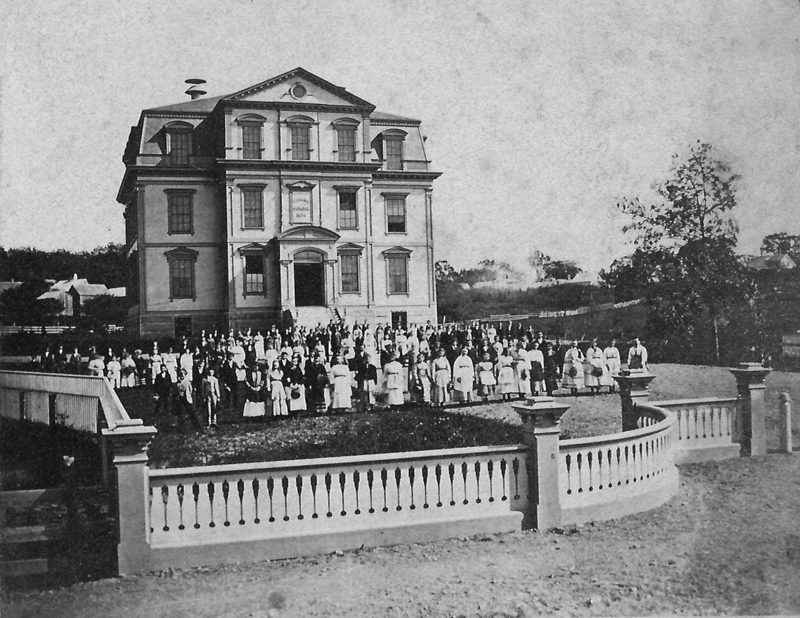 The perennial difficulties under which these schools were carried on were the fluctuating attendance, due to the incoming of the large boys and youth, and young men, often of legal age, for a few weeks of schooling in the winter, the consequent crowding out of the young children and the older girls, and the constant change of teachers. A female teacher was invariably employed in the summer, but for the winter, a man was essential. Unfortunately, the salary was so small, that only young men, often college students who were eking out their scanty funds by a few months of teaching, were the only teachers available. Their youth and inexperience, and the large proportion of pupils in the crowded school rooms, led invariably to a constant struggle to maintain decent order.